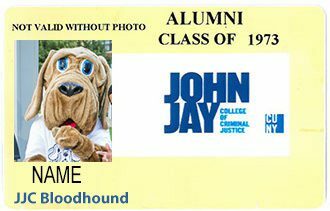 All John Jay degree holders are automatically Alumni Association members and may order alumni ID cards (with photos and swipe technology) online. Alumni photo ID cards now certify lifetime membership, do not expire and provide access to alumni benefits — including a complimentary subscription to our electronic newsletter Alumni News! A minimum donation of $10 would be appreciated and an email confirmation will be sent. To pick up your new card and/or take a new photo, after a 48- hour interval, please take the email confirmation you received and a recent government-issued photo ID to the Office of Public Safety, Room L2.61, New Building. The office is located on Level L2 at 524 West 59 Street (between 10 Ave & 11 Ave), New York, NY. The Office of Public Safety is open for card pick up from 9:00 AM to 5:00 PM, Monday through Thursday. To request an individual appointment during off hours, please call (212) 237-8524. 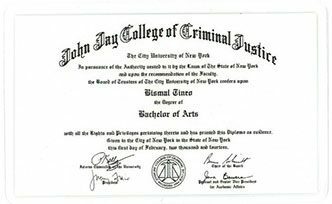 All graduates holding John Jay degrees are automatically members of the Alumni Association and may order mini –diploma alumni cards by mail. Each mini-diploma card is accompanied by — and features on its face — an exact replica of your official diploma! Members of each current graduating class will receive a complimentary mini-diploma alumni card inside the large envelop containing each official diploma. Alumni in all other classes may submit orders as noted below. Your mini-diploma alumni card now certifies lifetime membership, does not expire and provides access to alumni benefits — including a complimentary subscription to our electronic newsletter Alumni News! Please download and follow the application instructions. Applications are processed approximately 4-6 weeks from receipt. The name and student ID information on your application must match the student information on file when you attended the College. If your name was changed legally after graduation, please send a Change of Name application as well. If you have other questions about mini-diploma cards, please registraraudit@jjay.cuny.edu. Thank you.